Former national star Nii Ordartey Lamptey has signalled his intentions of serving his country ,Ghana again if he is called to do so. 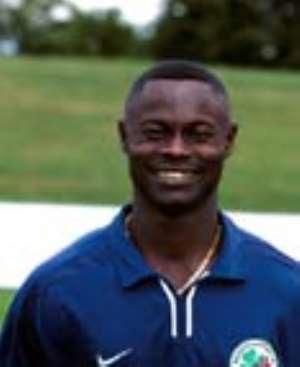 Lamptey who took the world by storm in 1991 in Italy, Australia 93, Barcelona 96 and attracted the attention of Brazilian Pele who proclaimed him as his successor plied his trade with some major clubs in Europe and the Asia accused previous FA adminisrtations for trying to frustrate him in order to jeopardise his career. Lamptey who is on holidays in the country says he has been approached by some overseas clubs but he is studying their proposals before any decision can be made. He set an example with Nigeria who use players on the basis of camp out- put therefore the good dividends that system has paid to their football. He was however optimistic of the Stars qualifying for the world cup in 2006 if the players will show commitment and die a little for the country whenever they are on national duty.